Rob Pudim is a contributor to Writers on the Range, the opinion service of High Country News. A writer in Colorado, he says his friend died while in hospice care on June 16. The West seems to have a different attitude about life and death than other parts of the country. Of the five states that allow medical aid in dying, known as MAID, four are west of the Mississippi — Oregon, Washington, California and Colorado. The fifth is Vermont and, although it is not a state, the District of Columbia. Other states have come close. Montana courts have found that there is no public policy against assisted death, and New Mexico briefly allowed it in 2014 before overturning it in 2015. In Arizona, the Legislature will not let the bill out of committee even though most Arizonans are said to favor it. 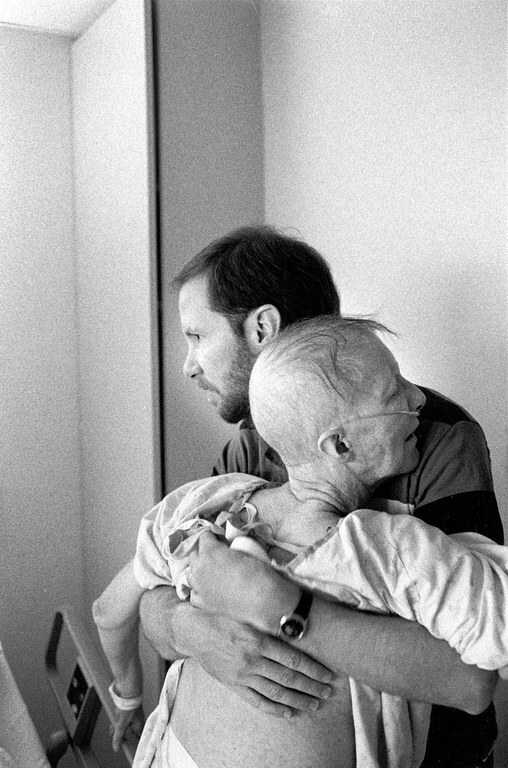 In this 2001 photo, breast cancer patient Mary Hall hugs her son, Paul, before taking a lethal dose of sleeping pills in Santa Rosa, California. It would be 15 more years before physicians could legally assist with a patient’s death in California. Most Westerners, I think, believe that allowing people to obtain medical aid to die is a simply a matter of choice that should not be a decision made by the state, a state legislature, a medical association, a religion or any other person. Maybe it has to do with the independence of people or geographical distance from each other, or the knowledge that we sometimes have to depend on only ourselves. A lot of us believe that each person has the right to decide about our life or death, and whether life is worth living when a condition is incurable and the future filled with pain. Granted, we all have the ability to commit suicide but generally that choice is not pleasant — jumping off Golden Gate Bridge, guns, death by police or an auto crash. If you assist or encourage someone — and there was a recent controversial case of a young woman encouraging a boyfriend to commit suicide — you can be charged with being an accessory to murder. Medical help in dying, however, is neither suicide nor murder, and most cases of a loved one helping another to die are dismissed. Briefly stated, it’s your life. It’s your death. It ought to be a personal and private choice. A dear friend I have known for more than 50 years has an incurable, progressive disease that will kill him. He is educated, alert and rational, and right now feels no pain or anxiety because a hospice manages his discomfort. Yet he does not like being tethered to an oxygen line while he slowly suffocates. He wants his life to be over but is too incapacitated to do anything about it. At one point he asked me if I could get him a gun. According to the Colorado referendum, two physicians have to agree that a person’s medical condition is incurable and the drug cocktail has to be self-administered. It sounds simple. What if your doctor has religious beliefs that preclude assisted dying, or has a literal interpretation of the Hippocratic Oath, which states that before anything else, do no harm? What if your doctor's beliefs require you to live out whatever life has dealt you? What if the pharmacist thinks the same way and refuses to issue the prescription? What if the hospital does not have the correct protocols in place or the legal boilerplate necessary to allow a patient to die by choice? What if the hospital is run by a church? What if you are physically unable to take the drugs you need to end your life? According to Compassion & Choices, a national organization that pushed medical aid in dying in Colorado, 10 prescriptions have been filled so far, but it is not known how many have ever been used. Advocates say about 1 in 3 patients who receive the drugs fails to take them. They may have just wanted the option available. My old and dear friend has been facing this. He could move to another state and establish residency, which could take at least six months, or is it a year? He does not have the time or ability to do this, though paradoxically he has a lot of time — to lie in bed and think about his future. Well, whose job is it when you’re stuck in a bed with tubes and wires attached to you? And what if this happened to you?